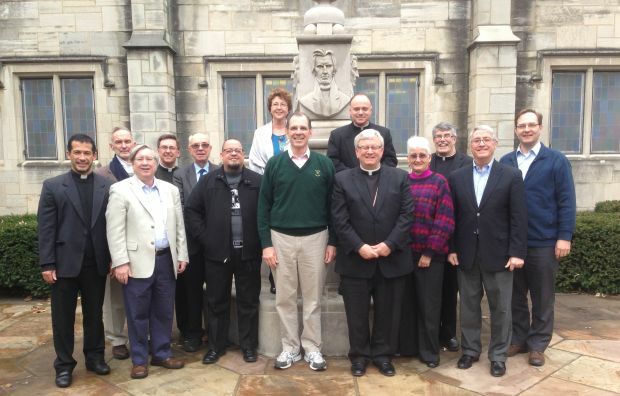 Participants in the International Commission for Dialogue between the Disciples of Christ and the Roman Catholic Church held Jan. 8-12 in Knoxville, Tenn., included Bishop David L. Ricken of Green Bay (center), Rev. Dr. Newell Williams, president of Brite Divinity School at Texas Christian University (left of Bishop Ricken) and Father Joseph Shenosky of the Philadelphia Archdiocese (behind the bishop). Father Joseph Shenosky thought about this quote as he participated in a session of the International Commission for Dialogue between the Disciples of Christ and the Roman Catholic Church held Jan. 8-12 in Knoxville, Tennessee. The priest of the Archdiocese of Philadelphia is one of seven Catholic delegates to the ongoing ecumenical dialogue of the International Commission, which is co-chaired by Green Bay (Wisc.) Bishop David Ricken and Rev. Dr. Newell Williams, president of Brite Divinity School at Texas Christian University. The Catholic Church has been in ecumenical dialogue with the Disciples of Christ at an international level since 1977. Father Shenosky was recently appointed to the Commission by Cardinal Kurt Koch, the president of the Pontifical Council for Promoting Christian Unity. Father Shenosky’s expertise in ecumenical affairs traces back to his four years of study at the Pontifical Gregorian University in Rome where his doctoral dissertation for his doctorate in sacred theology, “The Development of Late Twentieth Century Ecumenical Theology in the U.S.A.,” was published in the university’s Tesi Gregoriana Series. Currently he is director of pastoral and apostolic formation at St. Charles Borromeo Seminary. His responsibilities include coordinating the Field Education Program, teaching theology in both the College and Theology Divisions and serving as a formation adviser to seminarians. The next session of the International Commission will be held in Rome, June 14-20. The Eucharist illustrates what The Holy Spirit taught me. “Two things can be true at once,” versus either-or as we are wont to–Catholics tend to defend against a “memorial supper” Saying the Eucharist is MORE than JUST a memorial supper. Before we move on to the “more than,” LET US EXAMINE “memorial supper”: “Do this IN MEMORY OF ME”; MEMORY is MEMORIAL!!! This was SAID BY JESUS. But the argument is that non-catholics SAY JUST a memorial!!! Right? DIE? This is NOT ‘regular ol’…NOT BY A LONG SHOT. Now, Look,…Catholics are saying THAT, that THIS IS NO REGULAR MEAL, BUT SUPERNATURAL!!! And so is THE BIBLE. So. Memorial. MORE than bread-and-wine. Both THINGS CAN BE TRUE AT ONCE. And are. I Tell, BELIEVE THE WORDS–AND TAKE THEM AS FAR IN THE HOLY SPIRIT AS THE HOLY SPIRIT WILL… You will discover much. STICK WITH THE SCRIPTURE. DO NOT ARGUE ABOUT “EXTRANEOUS WORDS” WHICH EXPLAIN–AND LET THE HOLY SPIRIT DO THE EXPLAINING. Consider “transubstantiation” A DISCUSSION THAT IS 2ND OR 3RD GENERATION WORDS AND LIMIT THE DISCUSSION TO 1ST GENERATION WORD-IN-THE-BIBLE. That after all is what transubstantiation is supposed to EXPLAIN–LET US NOT FOCUS ON THE EXPLANATIONS. WE ARE INSERTING OURSELVES BETWEEN THE WORD AND THE PERSON–AND THE WORK OF THE HOLY SPIRIT IN THAT PERSON.+<3–CAPICHE?